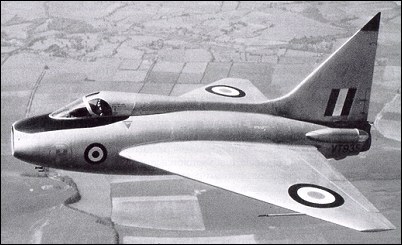 The Boulton and Paul P.111 research aircraft was built to specification E.27/46, to further investigation into delta wing characteristics at transonic speeds. The only example, VT935, first flew on October 6, 1950, and was powered by a Rolls-Royce Nene turbojet of 5,100 lb st. It featured a 45 degree delta wing with detachable tips to enable comparative tests of blunt and pointed wings to be made. The fin tip was also removeable. Data recording equipment, including a fin-mounted camera, was fitted. It originally flew in natural metal finish and was supplemented from August 1952 by the P.120. A critical feature, that of total hydraulic, irreversible, powered flying controls allowed artificial feel for the pilot was by way of built in springs which could not be fully trimmed to take into account the very fine degree of control necessary, particularly with the minimal input demanded at high IAS. The design work was carried out at Farnborough, and all of the early flying was by Aero Flight pilots including Bob Smythe CO, Jim Harrison, and Jock Elliot. Jock carried out most of the flying with 52 flights totalling some 26 hours. He commented on the sensitivy of the controls at IAS, stating that, at 500 kts IAS, 1/4" stick movement gave 1"g" of acceleration, and observed that the possibility of a strong reflex input was very real and would have catastrophic results. Following a belly landing by Jim Harrison the design was near to being shelved, when Jock came up with the idea for variable gearing between stick and surfaces; this facility would be available to the pilot in flight and would allow a choice ranging between 1:1 to 4:1. Jock pointed out that the idea was not new and that some of the Schneider Trophy aircraft had incorporated the idea. The idea was discussed at a meeting with Dennis Higton, aerodynamicist at RAE, JD North of BP, and Jock, and the outcome was that it was incorporated into the design, as the BP P111A. The point has been made that Jock's concept of variable gearing was an crital break through for the aviation industry and virtually paved the way for Concorde and all high speed aircraft that followed. 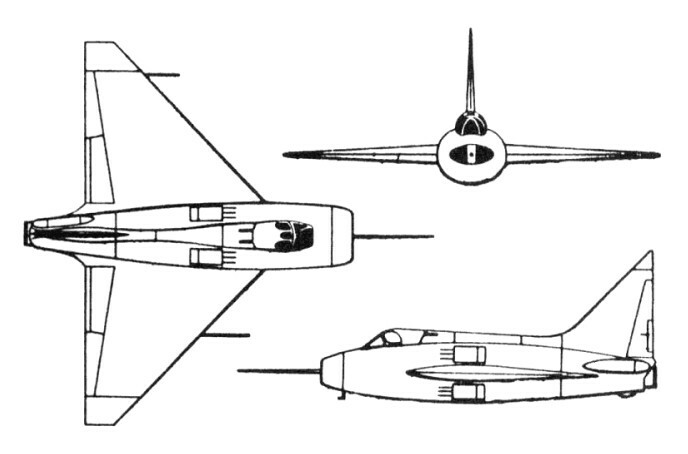 In 1953 the aircraft underwent internal modification, and also had four rectangular air brakes fitted around the fuselage behind the cockpit a nose probe. Redesignated P.111A, it made its first flight in this form on July 2, 1953. Ben Gunn flew the aircraft in it's P111A form. Its research programme at RAE Bedford ended on June 20, 1958, by which time it had attained Mach. 0.93 in level flight. In April 1959 it was purchased from the Ministry of Aviation by the College of Aeronautics at Cranfield, Beds. It was then used in their Department of Aircraft Design to demonstrate variable gearing power flying control systems and general hydraulic services, and also for basic research on the ground resonance of a low aspect ratio wing. The P.111A survives in the Midland Air Museum at Coventry's Baginton Airport.